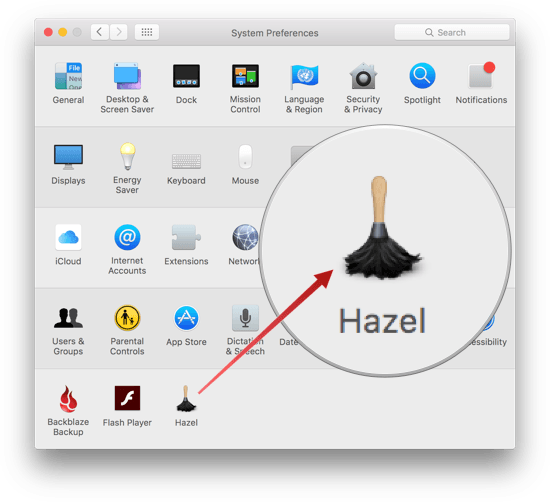 Hazel is one of the first utilities that I install when I get a new Mac. Judging from the Noodlesoft forums, there are many people who use Hazel far more heavily than I do, but it is no less important to my Mac setup. By automating what would otherwise be repetitive file management tasks, Hazel helps keep me focused on more important tasks. Today, Hazel 4 was released with new features and refinements that bring new power and convenience to an already exceptional app. 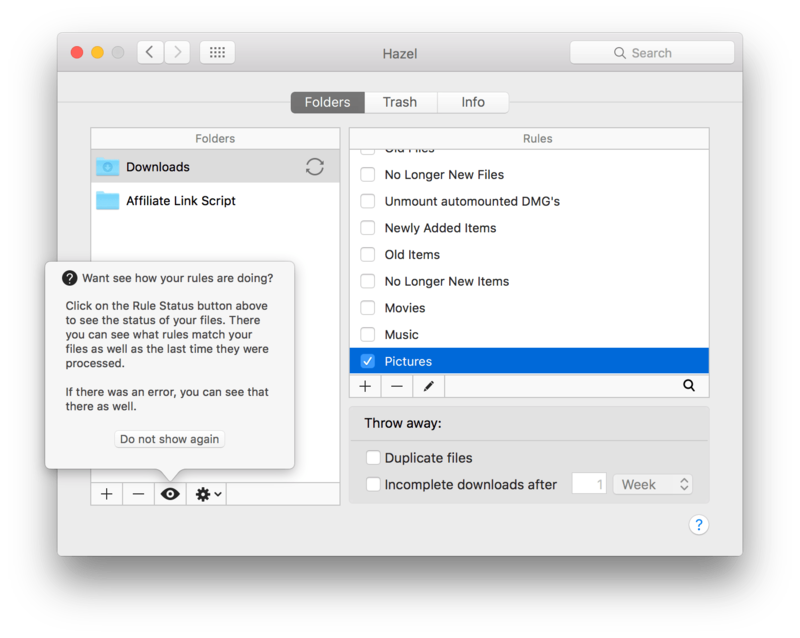 Hazel resides in System Preferences as its own pane and works in a manner similar to the IFTTT web service, but instead of taking actions based on web service inputs, Hazel takes actions based on file attributes. The process for setting up a Hazel rule is reminiscent of building a Smart Playlist in iTunes. To build a rule click the ‘Folders’ tab in the Hazel preference pane and select a folder to monitor.1 To create a rule, click the ‘+’ button at the bottom of the ‘Rules’ list to open the rule-builder, name your rule, pick attributes to monitor, and define the states of those attributes that will trigger an action. For example, you could monitor your Downloads folder to check whether the ‘Date Added’ of each file in that folder ’is not in the last 30 days’, and if any are, ‘Move’ those files to the Trash. With over 20 attributes to chose from, each of which has several states that can be monitored, and a similar number of actions that can be taken, the permutations are seemingly endless. But the sheer complexity of the rules that could be created with Hazel also made testing rules difficult. Probably my favorite new feature in Hazel addresses that problem by introducing a live preview system. As you create a rule, you can click on the Preview button next to the file attributes you are testing and pick a file to test those attributes against. If the file attributes match the file you pick, Hazel displays a ‘Rule matches’ message; if the attributes don’t match, you get a ‘Rule does not match’ one. It’s a great way to quickly iterate when designing a rule without actually running the rule and affecting files. After you set up a rule, you can assess its performance by clicking the button with an eye icon at the bottom of the folder list, which opens a status log that lists the the rules matched for files in that folder and the dates they were matched. That means that if your rule moved a file out of the folder being monitored, it won’t be in the log, but it’s a nice way to track the performance of your rules that remain in a monitored folder. Hazel 4 also adds rule syncing. Your rules are bundled into a .hazelrules file that you can save locally or with a cloud-based storage provider like Dropbox. 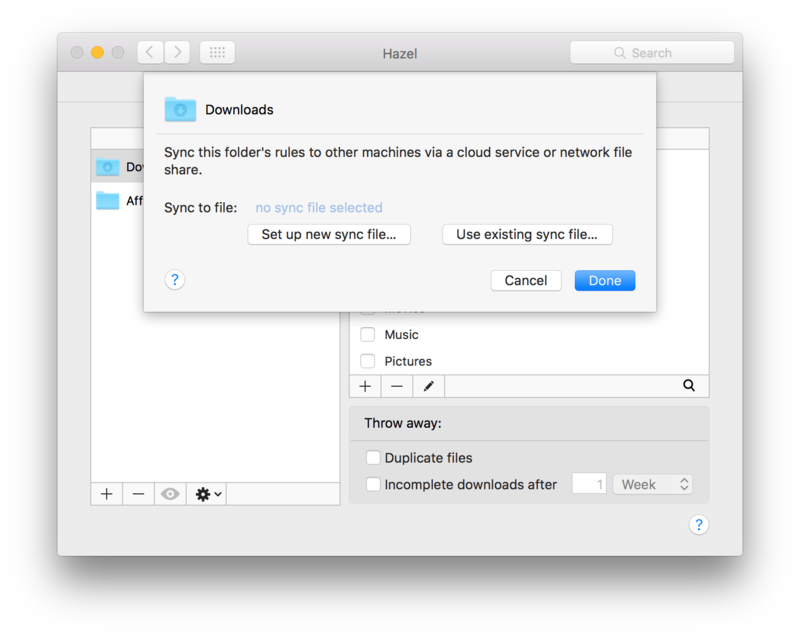 You can designate your rules file as the sync file for other folders that you monitor with Hazel on the same Mac so each folder has an identical set of Hazel rules, or save your rules file to a cloud service and use it on another Mac that has Hazel installed so your rules stay in sync across multiple Macs. 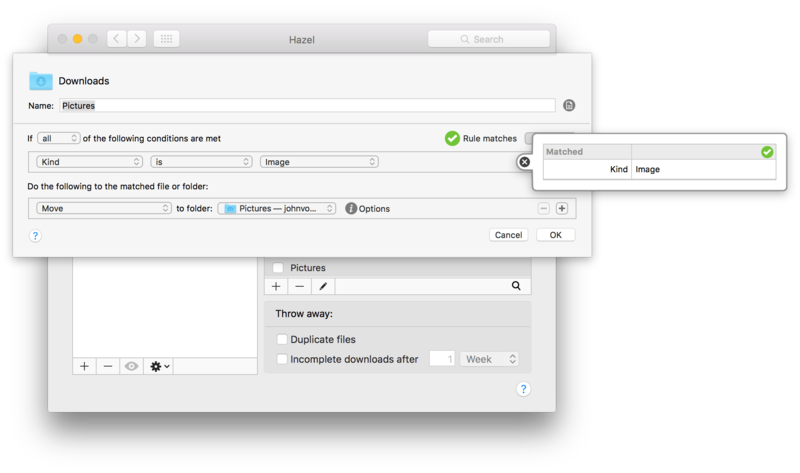 Also new to Hazel 4 is the ability to monitor and apply rules to files in Smart Folders. There is one caveat to using Hazel with Smart Folders, though. Unlike regular folders, you cannot perform actions that require access to, or matching of, subfiles or subfolders. Hazel 4 has a number of other nice additions and refinements such as the ability to search your rules, which makes it easier for those with large numbers of rules to find a particular rule, and an action that lets you toggle the display of a matching file’s file extension. Hazel is a complex and powerful tool that is easy to get into with simple rules, but a little daunting when you try to do something more complicated. The ability to preview rules and check on their past performance through the status interface goes a long way toward improving the development of rules. That, along with syncing and the other refinements that Hazel 4 brings to the table, makes Hazel 4 an automation powerhouse that is well worth its price. Hazel 4, which requires a Mac running 10.10 (Yosemite) or later, is available directly from Noodlesoft. 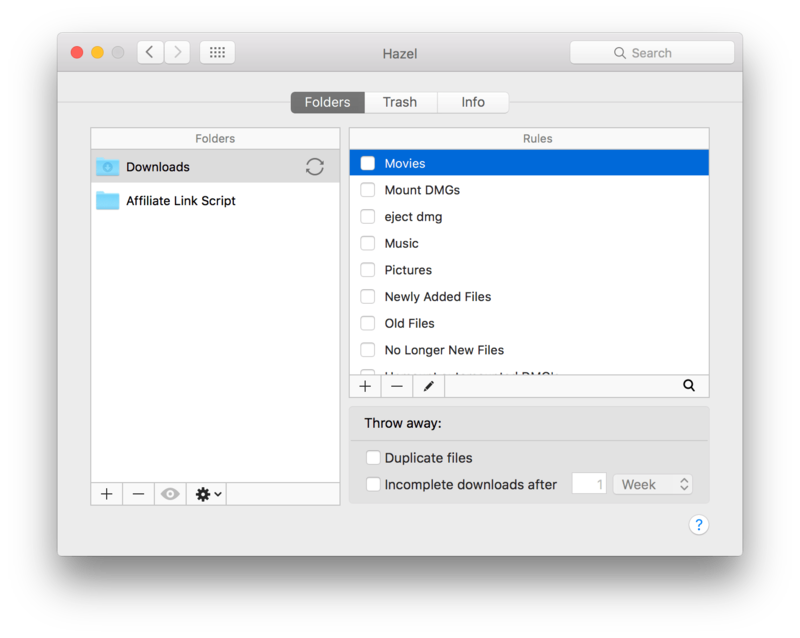 New users can buy Hazel 4 for $32 for an individual license, and $49 for a family license. Customers who bought Hazel 3 since September 6, 2015 will receive Hazel 4 for free. Other customers can upgrade for $10, regardless of the type of license they originally bought.